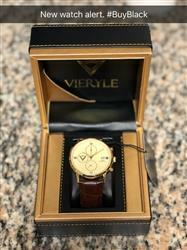 I've got the golden cream face with brown leather Vieryle Edict kickstarter edition. It's a very well made, good looking and beautiful wearing watch. Also the box in which it came is absolutely quality. I love this company and I'm proud that I'm one of the backers that helped making this watch and company become a reality. Without a doubt one of my favorite watches. This watch exceeded my expectations. Very well designed! Love the quality. The engraving on the back is a nice touch.